Music sets the tone for your wedding, personalizing your big day from the first step down the aisle to the last dance of the evening. Eager to help you create your perfect playlist is KDL Productions, a disc jockey, event rental, and lighting design service. At KDL Productions, dedicated staff members with state-of-the-art equipment are there to help you plan the sound and light show for your big day. 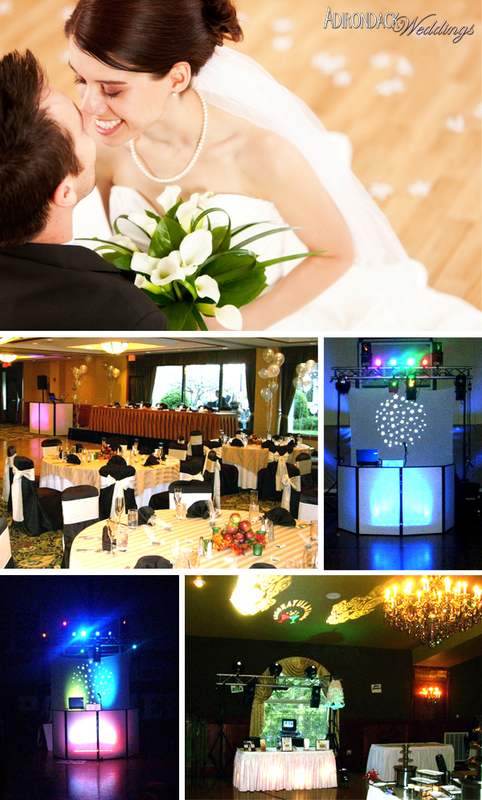 Every wedding package includes two staff members, the client’s choice of music and attire, a basic light show, and complete planning and coordination, as well as a backup disc jockey (DJ) and equipment. Getting married outdoors or in a large room? No problem! Ceremony music set-ups and wireless microphones will ensure your guests hear your vows without straining their ears. To contact KDL Productions and learn more, visit KDL Productions in the Adirondack Weddings vendor directory. A good friend of mine used KDL Productions for her wedding. She was really happy with their professionalism and attention to detail. I was at the wedding as a guest and have to say the music selection was great and they kept moving the night right along. They also had a light show during the first dance as husband and wife that was just beautiful! I’m considering using this company to provide the music for my wedding next spring. I love the light show they have available. It’s really a unique feature. Thanks for the feedback, Leanne! That is great to hear. Anyone looking for a DJ should definitely get in touch with Jim of KDL Productions.